This easy hummus snack idea is the ideal meal prep snack for on-the-go families. My simple veggies & hummus snack box pairs lots of fresh veggies with perfectly portioned mini hummus cups. So you can grab a budget-friendly healthy snack any time you need it! Yeah, I’ve discovered that softball tournaments are an entirely different animal. Whereas soccer tournaments typically have two games in a day with a leisurely break in between, softball tournaments can have up to four games in a day, often back to back with no time to leave the fields to grab a bite to eat. Snack boxes are all the rage these days, and with good reason. They’re portable, customizable, and perfectly sized — the ideal solution for on the go families. They’ve quickly caught on with my kids, and I often find them grabbing them for lunch, in addition to tossing them in their pool and sports bags. My favorite is a simple veggies & hummus snack box. I start with my favorite brand of hummus for dipping — Sabra Classic Hummus. It’s creamy and delicious with just the right amount of zingy garlic. Don’t get me wrong, I LOVE garlic. But if that’s all I can taste for the rest of the day when I’m out and about, forget it. 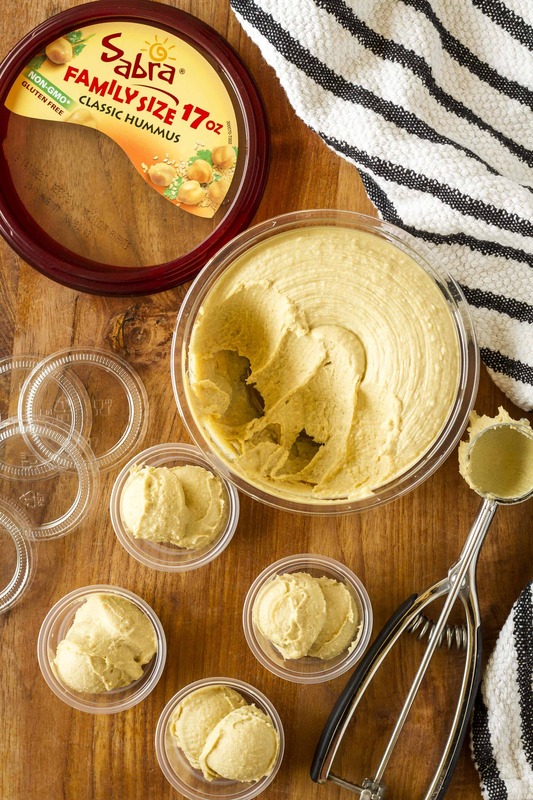 Sabra does make individual hummus cups, so you could skip this step altogether. But I find it just as easy, and perhaps slightly more budget friendly, to portion out my own mini hummus cups from a large 17-oz. family size container. I snagged some of those little 2-oz. disposable mini cups at Walmart, and they’re the perfect size to hold about two tablespoons of hummus. Using my favorite one-tablespoon cookie scoop makes it easy to spoon out servings. I placed one mini hummus cup in each of four small square reusable snack containers. Then I fill them each with lots of fresh veggies, like the multi-colored peppers and sugar snap peas shown. Cucumbers, baby carrots and celery are also excellent choices with hummus. I also tossed in a string cheese stick for a bit of protein. 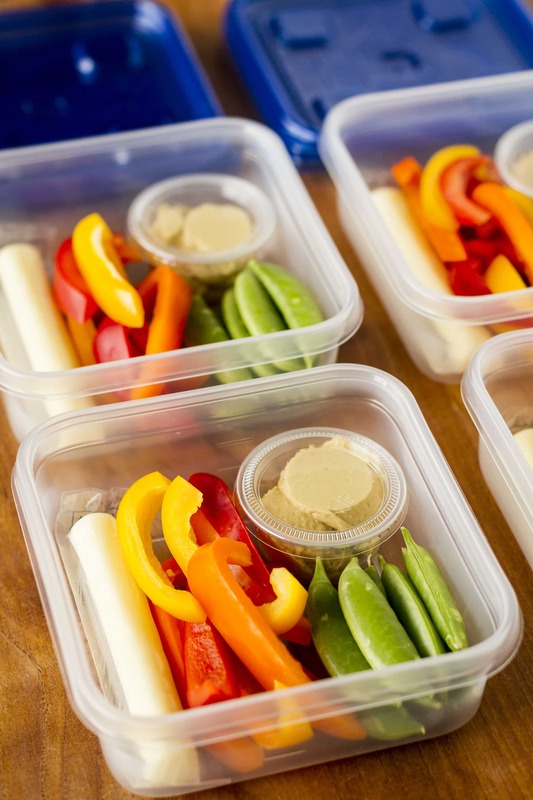 If you meal prep, these snack boxes could easily be turned into a light lunch. To round this out into a meal, just add in a hard boiled egg or two, and you’re set! This easy hummus snack idea is the ideal meal prep snack for on-the-go families. 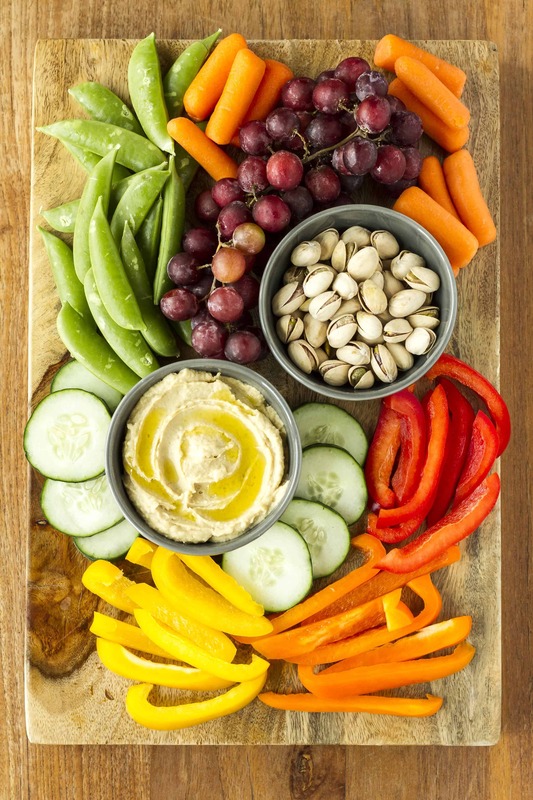 This simple veggies & hummus snack box pairs lots of fresh veggies with perfectly portioned mini hummus cups! Portion out 2 tablespoons of the hummus into 4 mini plastic cups with lids. 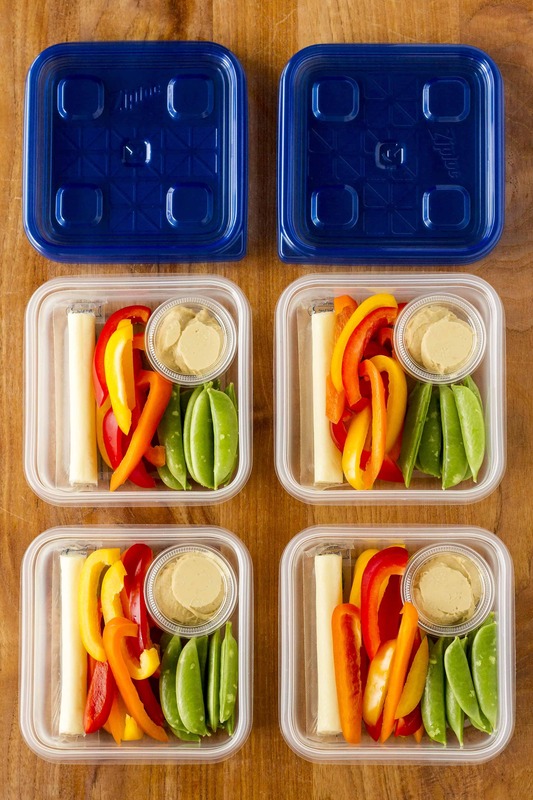 Place one cup each in 4 reusable snack size containers. 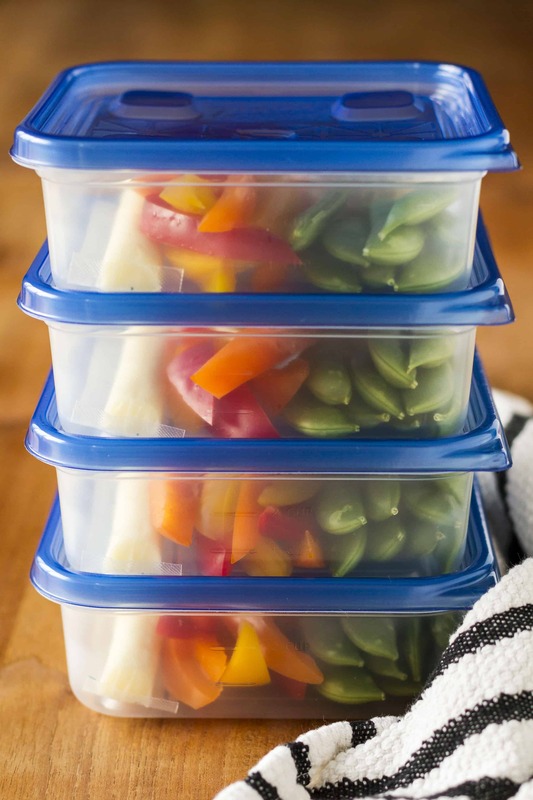 Lay a piece of string cheese in each container. Fill the rest of the container with the sliced peppers and sugar snap peas. Cucumbers, baby carrots and celery are also excellent choices with hummus. Add a hard boiled egg or two to turn this into a light lunch option. If I haven’t sold you on eating more hummus with this simple snack box idea, here’s another reason it pays to keeps delicious Sabra Classic Hummus on hand… It makes for the easiest snack platter for entertaining! Whether you’re hosting a backyard cookout or a wine tasting party, this spread will fit right in. Visually, this hummus snack platter is a step up from chips and dip, but it’s almost as effortless to put together. I like to add some nuts for a little saltiness and grapes for sweetness, then fill the rest of your platter with lots of colorful fresh seasonal veggies. Be sure to cut up extras to replenish it throughout the evening! Enter the Sabra Summer Grilling Sweepstakes for a chance to win a new Dyna-Glo grill, cover and utensil set or one of three $100 Walmart Gift Cards! NO PURCHASE NECESSARY. Open to legal residents of US.DC. 18 years of age or older. Begins at 12:00:01 a.m. EDT on 6/10/17 and ends at 11:59:59 p.m. EDT on 7/21/17. Official Rules Sponsors: Sabra Dipping Co., LLC, Dallas, TX. This is a sponsored conversation on behalf of Sabra; all opinions and text are my own. Sabra is the perfect snack for on-the-go families, as well as for summer entertaining. Find it in the deli section at Walmart!